Breaks the image into rectangle shaped tiles and transforms the image within each shape, to create a fly's eye view effect. 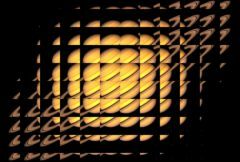 The 'Inside' parameters transform the Source image before it is tiled into the pattern, and the 'Tile' parameters transform the entire fly's eye pattern. Turns on or off the screen user interface for adjusting the Tile Frequency parameter. Show Tile Shift: Check-box, Default: off. Turns on or off the screen user interface for adjusting the Tile Shift parameter.